What can we do to liven the site up like it used to be? This isn't a suggestion more than it is a discussion on what we could do to attract more people to the site and keep it active. I know a lot of people are pretty busy with their personal lives, I've had my fair share of that with university work. But the times I do return here, the atmosphere of the site seems to be a lot less lively than it used to be. One of the main aspects about what keeps RMD alive, to me, is Drawchat, because it helps us connect to one another and keeps the community together; it's a place where we can talk to other artists whose interests are similar to our own, and make new friends. I've made a forum topic on Drawchat before, which includes improvements that could be made to it and so on, however the topic was moved to the moderator forum for further review. If there's any features, improvements or changes you want to see on RMD that would help it become a more lively atmosphere again, please share them below. I know mick is a busy guy and he has a family, but I'm sure if we all chip in as a community, we can sort something out! The best way to support our community is to just keep drawing - even if it's for fun and not serious. Another way is by taking time to occasionally rate and comments drawings by new or learning artists. I haven't been on for 3 years and I wanted to check up on everything, see how it's going. Probably 5 years ago, my friend introduced me to RMA (rate my animations) where I learned how to use frame by frame software to create little silent animations for people to enjoy. I checked up on that a while back to learn that the site was temporarily shut down, so I checked here to look for updates. I really do think we need to find a way to keep this place alive. I loved using drawchat when it was more active. I would always find a really creative group to brainstorm and eventually finish a well designed project. RMA helped me discover a new hobby and possibly my career path, and RMD helped me get to know the community more. I hate to see it all diminish like this. Maybe we could tell more people about it, maybe try to contact the old. A reunion sounds cool, I was thinking more along the lines of ways we can help new people become a part of the community, a place where they'd love to return to and share their drawings with one another. More than anything, RMD has given me friends I'm very fond of and look up to. We could try advertisement but in a free way, spreading the word, maybe making banners or fliers. My sister used to use RMD but she left as soon as it became a less active site. The point is, that many people went to dA and stuff or maybe they died o-o okno, so maybe making advertisements on dA for people, not only to come back, but also for them to join, I actually think it's a pretty fun site since there are more chances for other people to see your art ewe! everyone has cellphones now you should make a drawchat app that lets people go into the drawchat from their phones and tablets and also update drawchat. not even really just to draw, people like being there to talk with their friends. im sure people would use it. and drawchat in in itself needs to be updated. should be able to have a larger drawing area. i have a friend who used to come on dc all the time but you changed how the tools worked and apparently it made the lines worse so she stopped using dc. the drawchat drawing tools need to be improved, not just sloppily updated. add features that java draw has to drawchat. RMD needs more advertisement, whether that's from Mick or RMD's own members. Anything that can be done to spread the word about the site is a possibility to add more members, but just giving it exposure is not enough. It has to sink its hooks in you and entice you to stay. When I first came here, my big excitement was that this place was different from other places. I wasn't aware of deviantART, or conceptart. It just made it all really easy to make artwork, submit it into the community and Drawchat was just like an extension of that. Now we have Chibipaint and that other drawing tool, which I'm sad to say is quite a terrible application. It's buggy, and it lacks essential features. 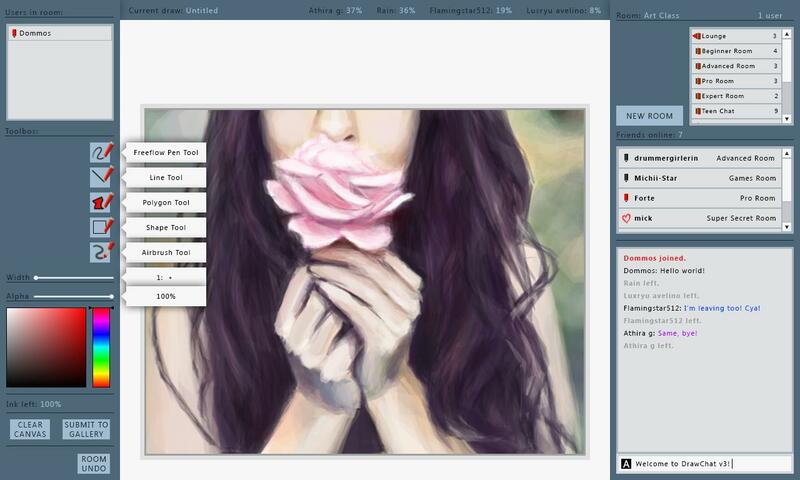 Flash isn't what it used to be, and it's the only thing Drawchat has to offer. We've also got really small canvases. RMD's biggest problem is that its innovations no longer make up for the lack of usability. The tools are primitive, almost a bit too much, and creativity is curbed. And other features of the site have to be bug-free, and be easy and simple to work without annoying bugs or confusing lay-outs. Right now, I'm sure a ton of manga artists see no reason to stick with RMD when they can continue using the more dynamic SAI, or Photoshop to submit work to the bigger community of dA, or what have you. And the more passionate, faithful artists still don't have as much control as they might like to have for their artwork. Drawchat for tablet and mobile devices sounds pretty neat, and it would also be a very useful feature for the site in terms of advertisement; it's a unique app that I don't think has been done yet. It might also be useful to have a Drawchat app for Chrome. - Increased FPS; right now the FPS is really low, which causes jittering when Drawchat is in Full-screen mode. The FPS could be raised to 30 or 60. This might however cause some problems for existing members if they are used to the current FPS. I have a lot of free time, so I could come up with some designs for the Desktop Drawchat and the Drawchat apps. So there's some changes clearly. I don't know how this will provide customization regarding layouts however to counter this, the left side tab (with the toolbox) will always remain left and the right side tab (with the chat and room sections) will always remain right. This means that on higher resolutions, you can resize the canvas and there will be much more room. There could be a way you can move the sections around and save the layouts, like the layout customization on Photoshop. One noticeable feature is the Friends section, which shows how many friends are online and what room they're currently in. You might have also noticed that there's a "Games Room", which is an idea for Drawchat, as I see a lot of people playing drawing games; this room could have limitations or "rules" centered around each game. This might also be more appealing to new users, providing a way to socialize with the community, play games and draw, all at once! Another noticeable change is the lack of tools. Firstly, all shapes (circle, square, filled circle, filled square) are located in the Shape Tool. The eyedropper tool has been removed because the new design relies on right clicking to grab colors, like in Chibi Paint. The move canvas tool has been removed because the new design relies on middle clicking to move the canvas, also like in Chibi Paint. The zoom tool has been removed - the three options it provided are static and had limits. Instead, you can grab any corner of the canvas and resize it to whatever size you want. This could also implement middle-wheel scrolling to zoom in and out. I forgot to include the Reference Image tool, however, there is plenty of room in the toolbox to add it, and then some. The boxes shown next to the tools are tooltips, which display the information associated to the tools. It also shows the size of the brush and the alpha %. The tooltip could also be used in multiple places on the canvas, such as showing the list of users in a room when you hover over the room name, or what time a user joined DrawChat. At the top is the current drawing's name and statistics based on who has drawn the associated percentage on the canvas. It's designed so that you can scroll horizontally through each user's statistics on the current drawing. It's also sorted from highest % to lowest %. 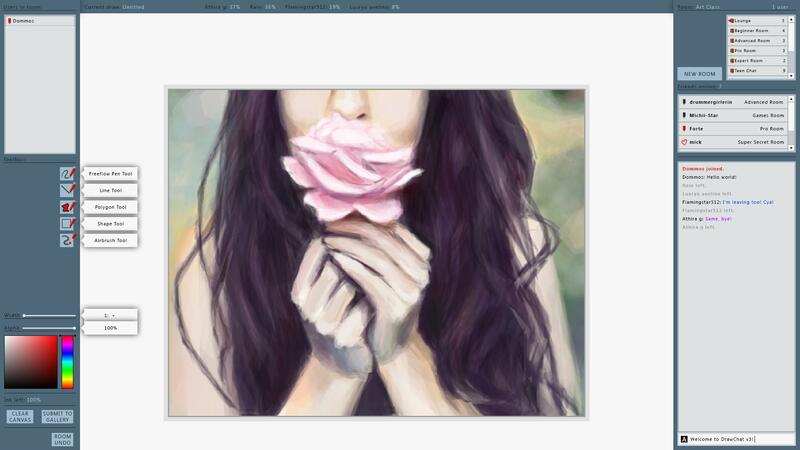 You can also rename the drawing at the top so that people know what you're drawing there and then. When you submit a drawing, the name you use to submit it will get applied to the top regardless. The chat is changed slightly; It now notifies you when users leave the room, and join and leave messages are bold. The Send button is no longer visible, since hardly anyone uses it; they just press Enter. You can put it back if you want to though, it just seems a little underused. Usernames are also shown in their correct case, instead of them being sent to lowercase. The color scheme nearly matches the site's main color scheme, keeping it consistent. As an added bonus, why not provide functionality to alter the color scheme? Let me know what you all think, if there's something you would change, or add, or remove! Based on the statistics above I've determined that the smallest size for Drawchat to display on is 1280x768. Screens with higher resolutions would increase the height of the "Users in room" section, the "Friends online" section and the Chat section, allowing more information to be displayed. I love the idea! It looks so much better and improved! I've always tried to be at least somewhat active on RMD, but recently I've been pretty inactive for two reasons. The first is that I used to log in to talk to friends, but all my friends haven't been online in a while now. The second is that I used to love using Java because it was better than the drawing programs I had on my computer, but more recently I got a new drawing program and I prefer to use it now. I have noticed that there are fewer active members on RMD than there used to be, and it's sad. It was so much fun when I joined 4 years ago, but now it's lonely. I'm inactive on this site-see my profile for the other sites where you can find me. I think an upgrade on the site would be nice but it would also take some time. We would have to be patient. I'm really confused by the screenshot. And why am I in it? It's a concept design I made that represents a new version of drawchat. Its a demonstration of the friends section. I just took people who had posted to this thread at the time. The poor message system really puts me off. I can't be arsed to reply directly since and for some reason using the reply button doesn't notify anyone. Communicating on this website feels like a lot of unecessary time and effort. Also there's some sort of java issue I tried to solve in the past but nope, I can only use flash. Egh. I like using the flash tool but apart from that, I'm not enthusiastic about this website. Ah, so like a fake screenshot? That makes sense. It looks interesting~ Don't know how I feel about the color scheme, though. I like everyone's suggestions. Fixing the glitches, making it less confusing, reunions, more advertising/spreading the word, updating DrawChat/the tools and making it more mobile all sound like excellent ideas. I especially think there should be notifications when someone posts a comment on your profile/replies to your comment on a/your drawing/or mentions your name etc. As well as getting rid of the 30 second rule to commenting and sending private messages.